Located at one of the busiest street of Kuala Lumpur, KIMI-YA Japanese Restaurant is a hidden gem in plain sight. 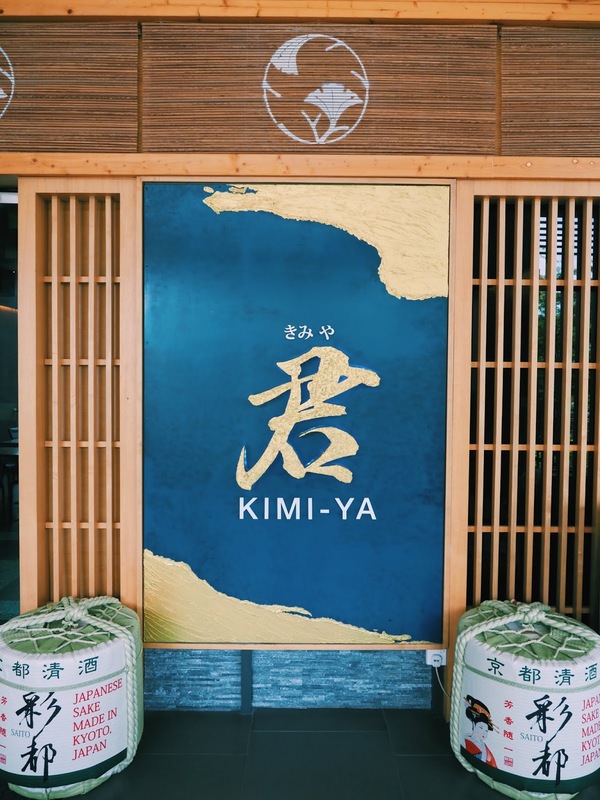 Kimi-Ya, which literally translated as "Your Home" in Japanese, I felt the warm hospitality from the restaurant upon stepping into it. KIMI-YA is located at the ground floor of Avantas Residences, which dining guests are entitled for a free 90mins valet parking service upon arrival. 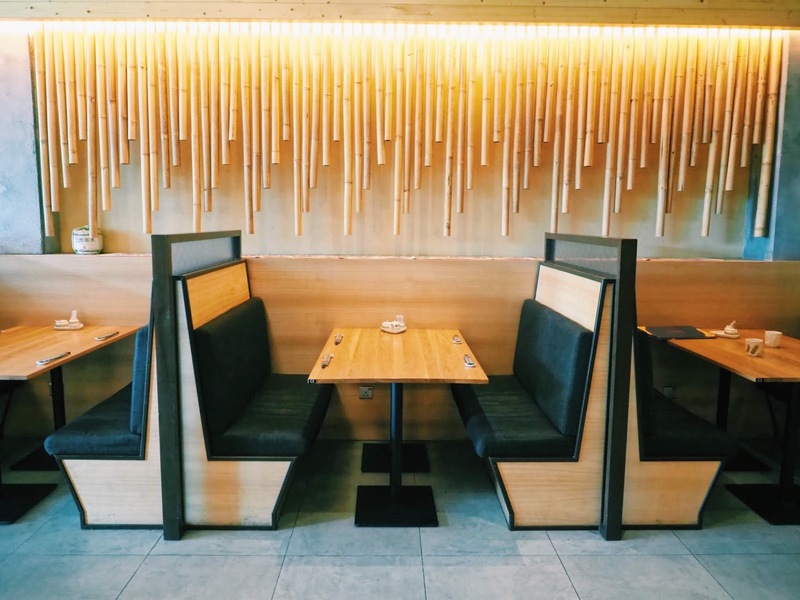 Using wood/bamboos as main interior element, dining guests were immediately transported to the land of rising sun just by dining in this restaurant. 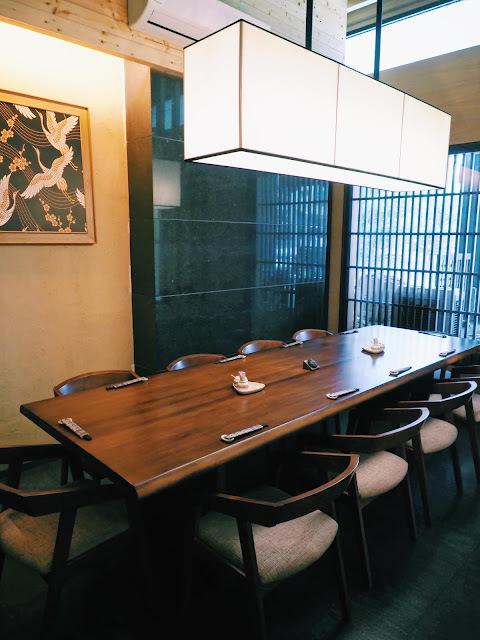 Browsing through their menu, it's not hard to find that KIMI-YA offers mid to high end authentic Japanese cuisine with a lovely price. 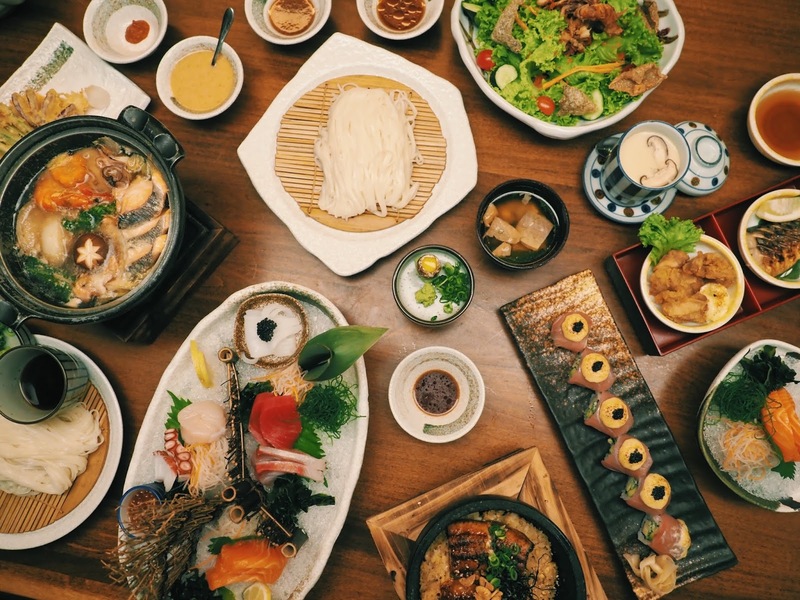 From Sashimi, wagyu beef to cold house-specialty udon, I had some hard time to decide what to order because they have so much to offer! Look at the generous amount of Avocados! As I grow older I'm craving for more green foods in my daily meals, especially fresh vegetables that will produce fibres for my body needs. 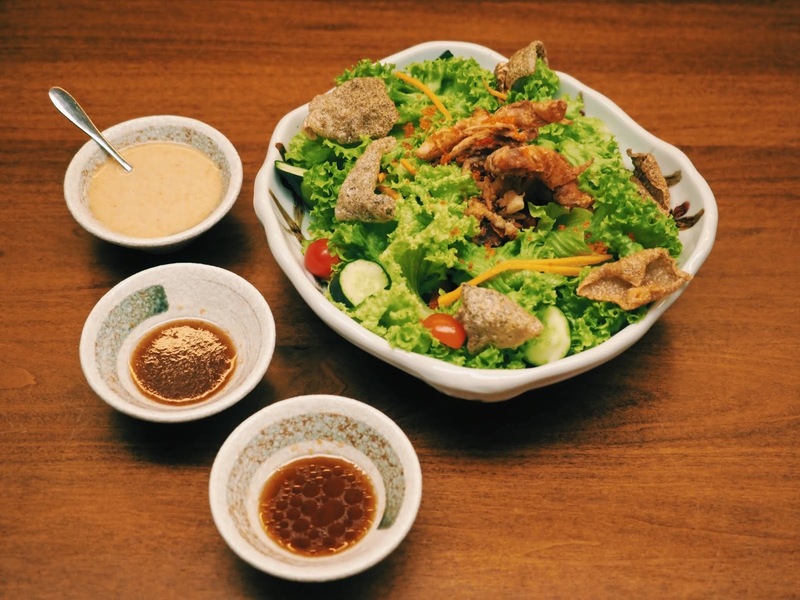 KIMI-YA's salads are packed with fresh vegetables and ingredients, paired with 3 types of house specialty salad dressings which you can't buy them elsewhere. We tried Yasai Salad as well as KIMI-YA Soft Shell Crab Salad on that day. 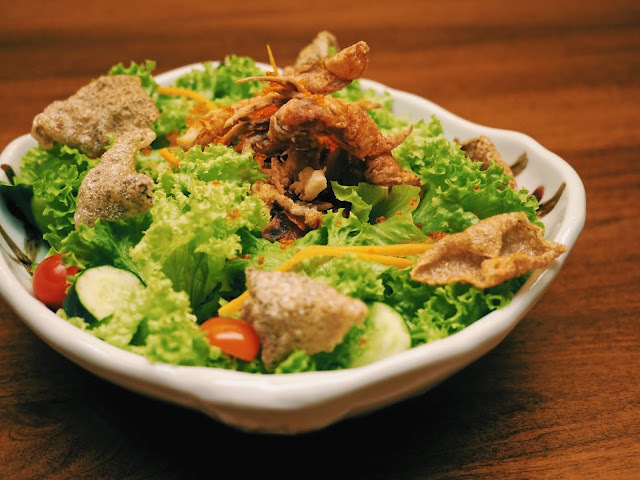 Yasai Salad has seaweed, avocado, sea moss with assorted vegetables and for the soft shell crab salad, they deep fried the soft shell crab as well as fish skin, sprinkles of ebiko with assorted vegetables. 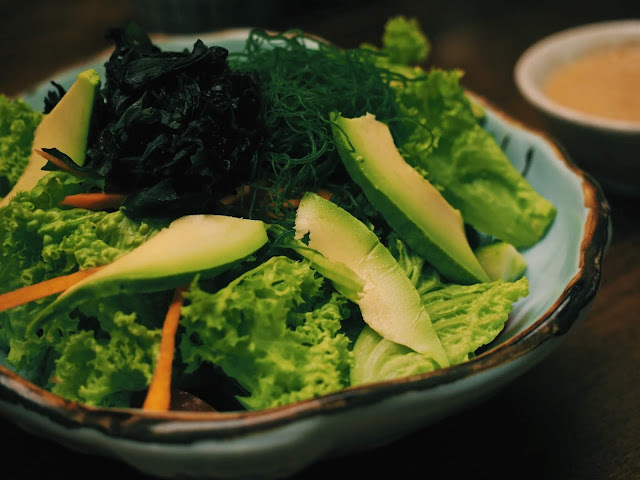 Diners can choose either sesame dressing, wafu dressing or yuzu dressing for their salad. As for me, I am always Team Sesame dressings. lol. Some of my friends literally crave for their salad dressings and wanted to buy them from the chef. Unfortunately they are not selling their secret recipes, but you can always come to KIMI-YA and satisfy your cravings as well as consume more vegetables for the benefit of your body. I think this is the first time I had black caviar toppings on my sushi roll! 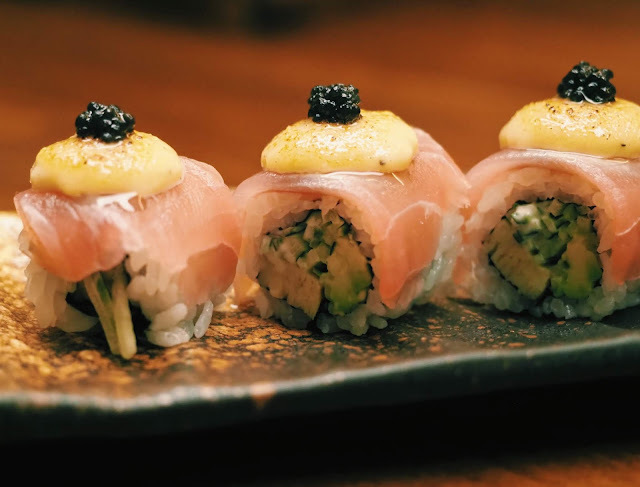 This luxurious sushi roll are made of avocado, omelette, cucumber, seared tuna with mayonnaise sauce and black caviar as toppings. The texture of this sushi roll is so smooth and I love how fresh the tuna tasted. 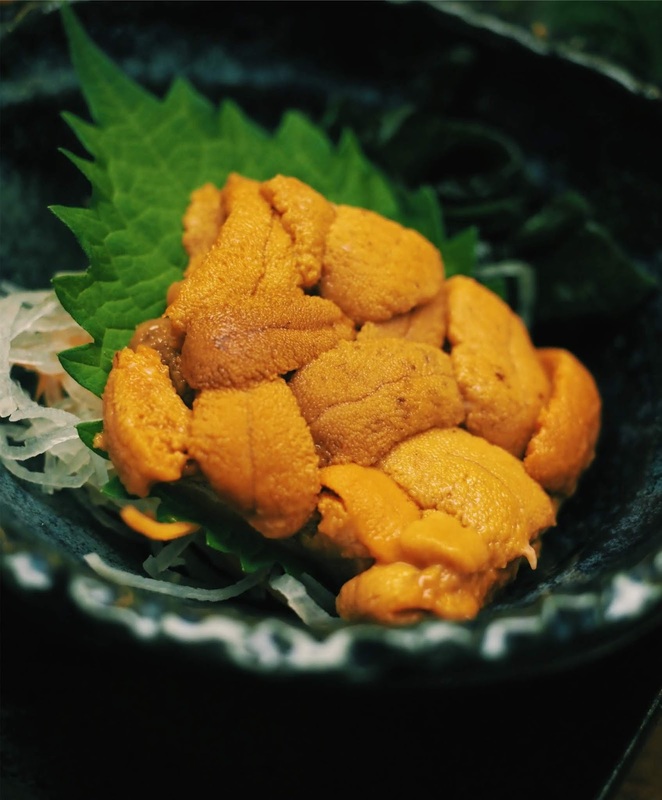 I had some bad encounters with uni at other Japanese restaurant which I shall not name but since KIMI-YA is well known for its fresh ingredients, I made a special request to try their uni and lucky me the chef offered us a generous amount of uni during my dining experience. Each and every fresh ingredients of KIMI-YA were directly imported from Japan, hence their quality were assured! Although August wasn't uni season (best season will be from Sept - April) but the uni presented by KIMI-YA wasn't any lesser quality. The mixture of fresh ocean taste and sweetness from the uni literally had me hooked and I can't stop eating the uni even though I had enough food for that day. 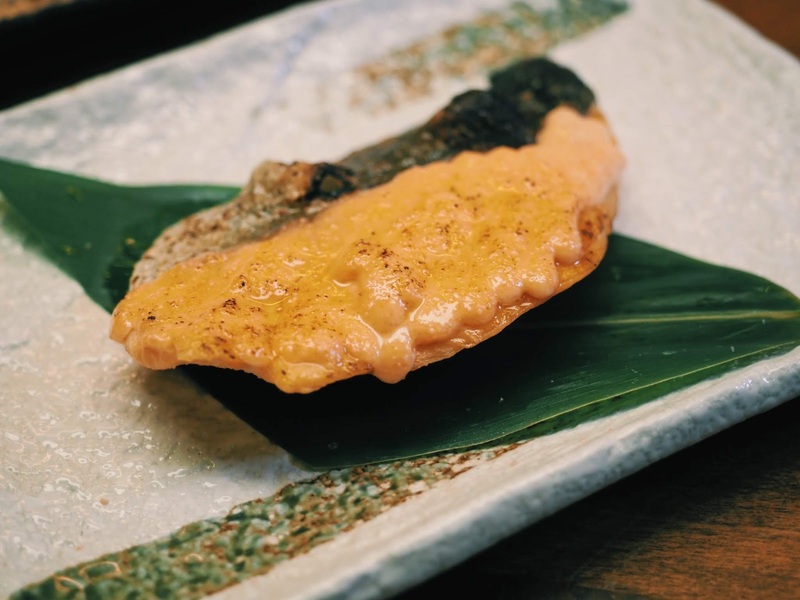 It changed my perception of uni, definitely gotta thank KIMI-YA for such wonderful uni tasting experience. 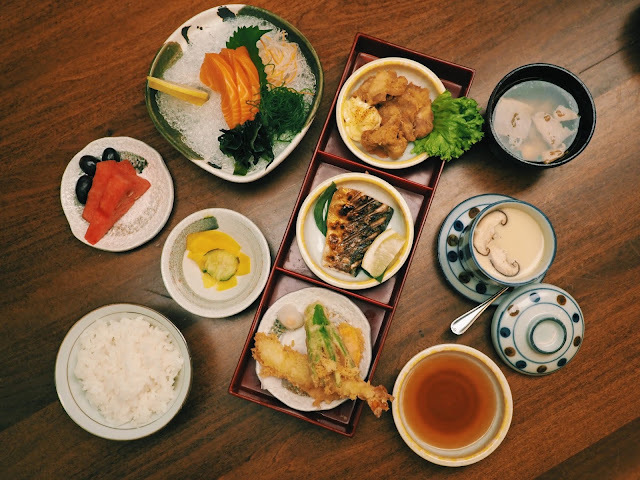 When Take means bamboo and Moriawase means assorted kind, this is another recommended dish from the restaurant. 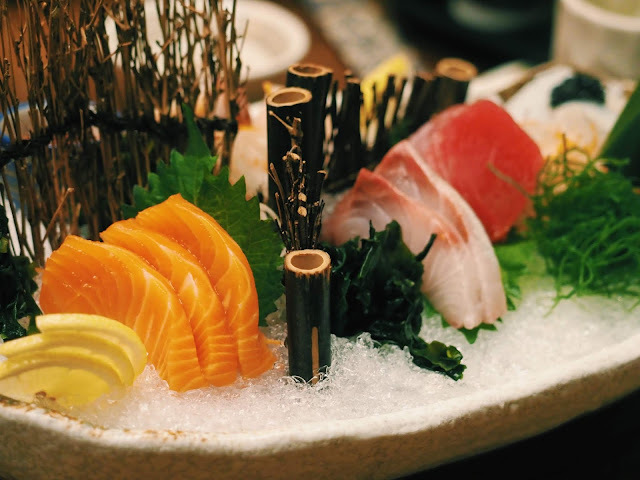 Several kinds of seasonal fresh fish served as sashimi, it provides different texture and taste to all diners. 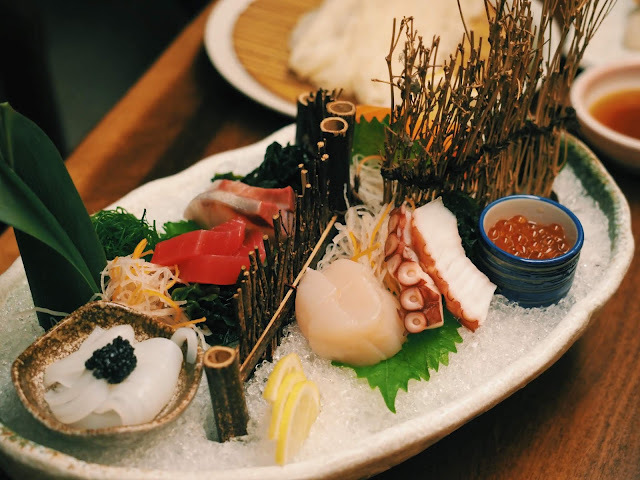 In this dish we had salmon, octopus, amberjack, tuna, salmon roe and scallop. Fei keeps on emphasize how buttery the amberjack tasted. 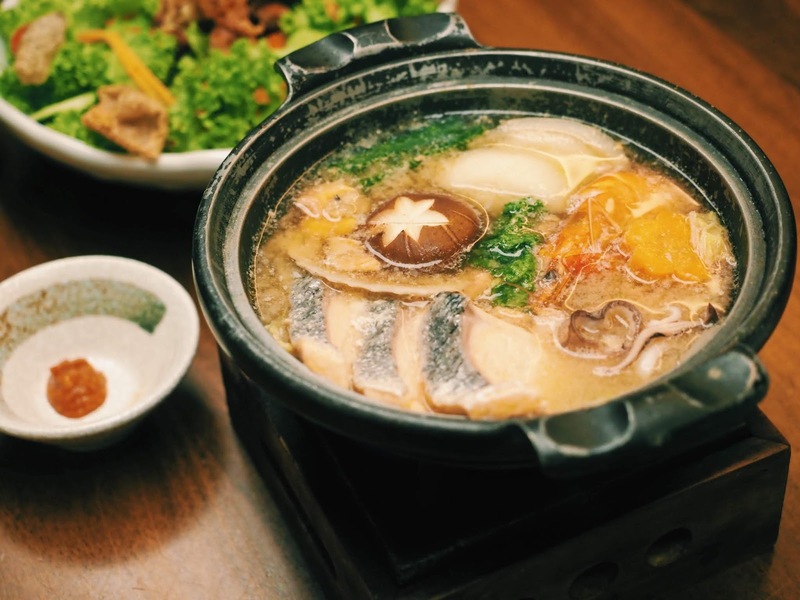 This warming bowl of hot pot dish is loaded with assorted vegetables, salmon and other seafoods with housemade miso that's good for soup lovers or rainy days. With a hint of spicyness due to the soybean paste, this steaming one-pot-meal gives me a flavourful yet satisfying after taste. 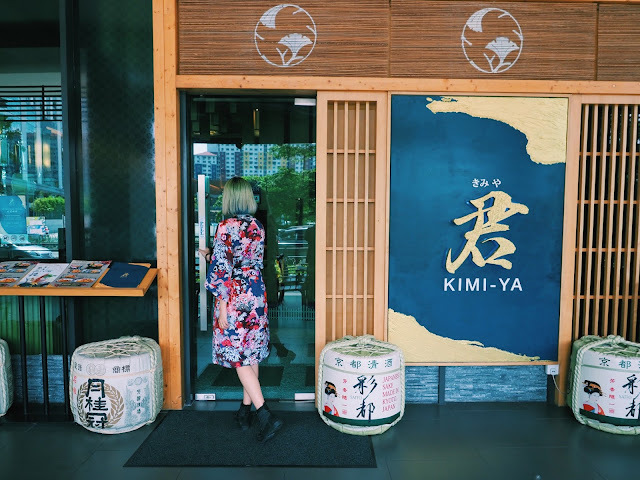 Honestly, I have to admit that KIMI-YA changes many perceptions of me towards Japanese cuisine, and one of them is the cold noodles. As typical Chinese, I like my food steaming hot, I find that it is unattractive when my mains are cold and I had cold noodles before(with ice cube?!?) and it was an unpleasant experience. When my friends told me the cold noodles of KIMI-YA is the best of all, I don't believe what they say. The Common Method: dip into soy sauce and slurp it! 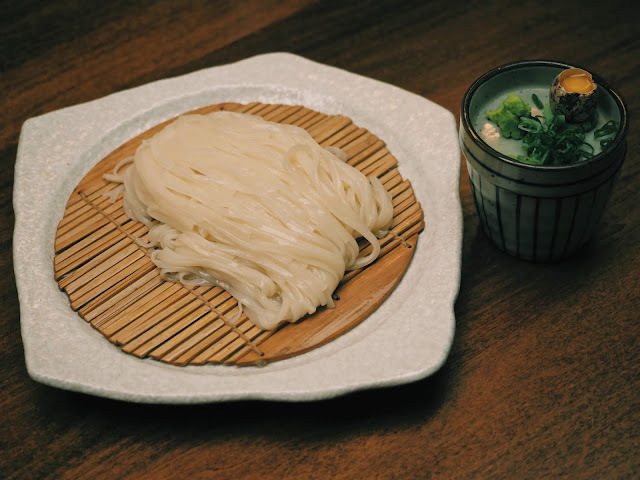 The chilled, chewy cold wheat noodles taste is super refreshing and yet tasteful when consume alongside with the sweet-salty tasted soy sauce. The Kick Method: Add a pinch of fresh wasabi onto the noodles, dip the bottom half of the noodles into the sauce and slurp it up! With that extra kick from the wasabi taste, this is the method I love most as the balance between wasabi and soy sauce gave the cold noodles an extra depth of taste. The Marriage Method: Add spring onions, quail eggs and wasabi into the soy sauce, stir it gently until yolk of quail egg broke, dip one chopstick full of cold noodles into it consume. You got to try the cold thin wheat noodles to believe how tasty they are. Made from scratch by KIMI-YA, this is a popular dish which received many positive feedbacks and got me craving for it as I'm typing this right now. 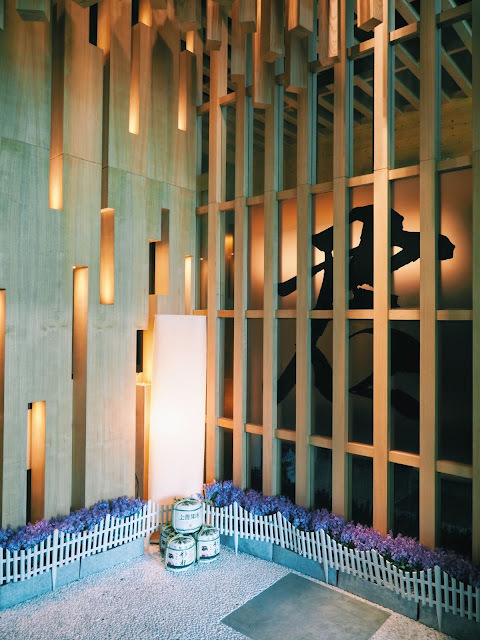 Maybe I shall visit KIMI-YA very soon before I fly off to Indonesia. Look at that shiny layer of seared marinated mayonaissed roe! Salmon Mentai Yaki is one of my favourite Japanese dish too as I love the taste of salmon and mentai yaki combined. This piece of fresh salmon grilled to perfection is one of the crucial element why I love this dish. Unagi Garlic Rice definitely tasted better than Unagi don with usual white rice. 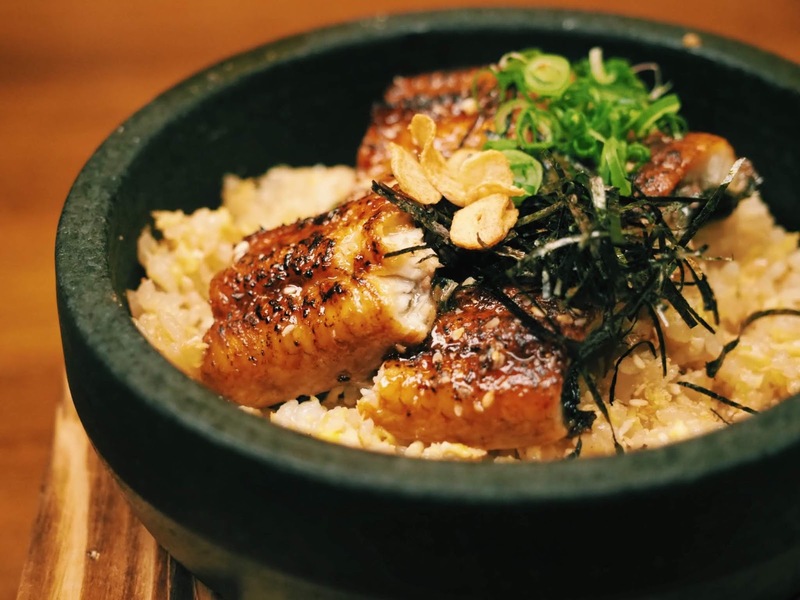 This bowl of garlic fried rice add extra aroma to the roasted eel, with seaweed, sesame, fried garlic and spring onions as toppings, there's no doubt that unagi lovers are gonna love this bowl of ishiyaki. 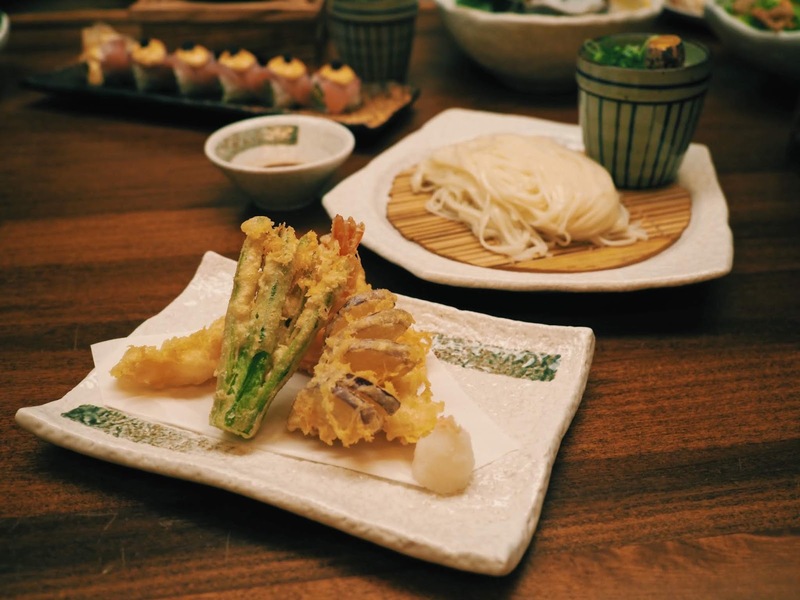 With Tempura Moriawase (assorted tempura), saba shioyaki (salt-grilled mackerel), deep fried chicken (my favourite!) and salmon sashimi, KIMI-YA bento served a "summary" of best dishes from the restaurant. From fresh sashimi to juicy fried chicken, this bento is definitely filling for the tummy and soul. 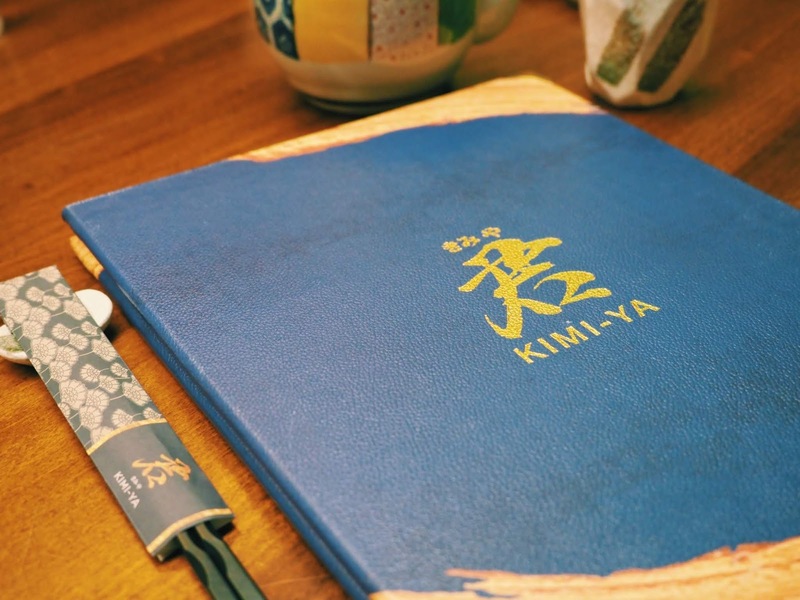 There are more good news for diners of KIMI-YA this September as kids get to eat for free! 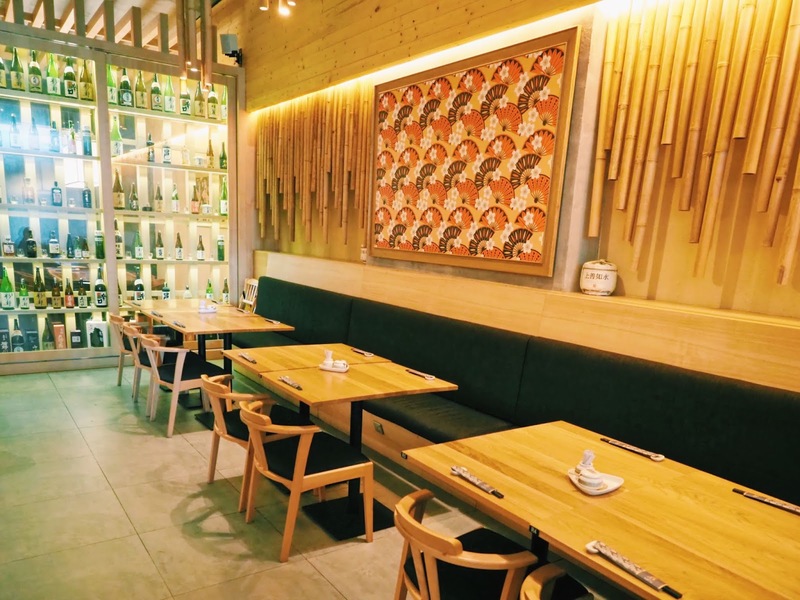 Diners are entitled for one free kids meal when RM50 spent in a single receipt, kids that are below 100cm can choose between udon set or zosui set (Japanese rice soup). 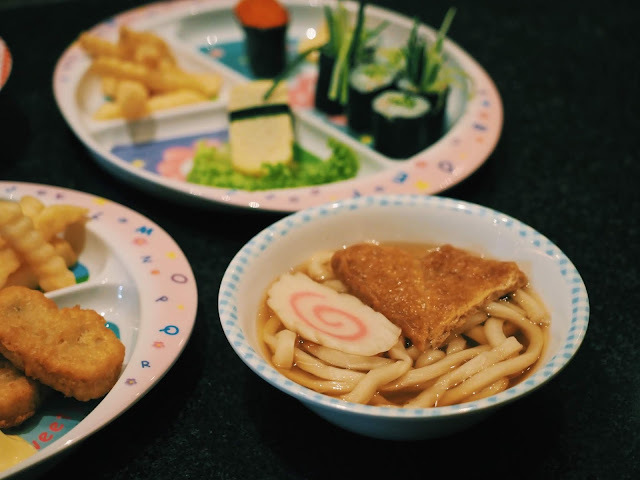 I'll call these Japanese-style happy meal! Last but not least: DESSERTS TIME! This is like the best Japanese raindrop cake I ever had! 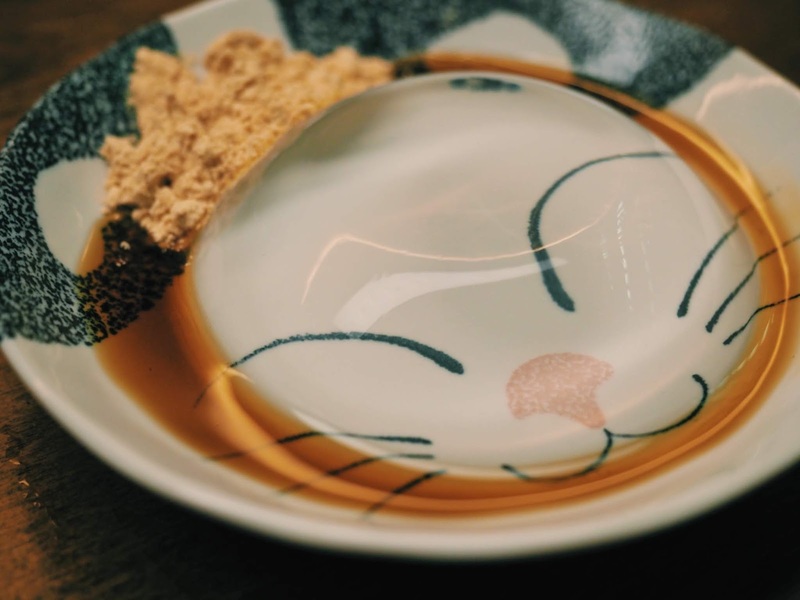 The brown sugar syrup and soybean powder tasted just nice, and it did not overwhelmed the texture and after taste of the raindrop cake. Definitely cute and edible in this case. 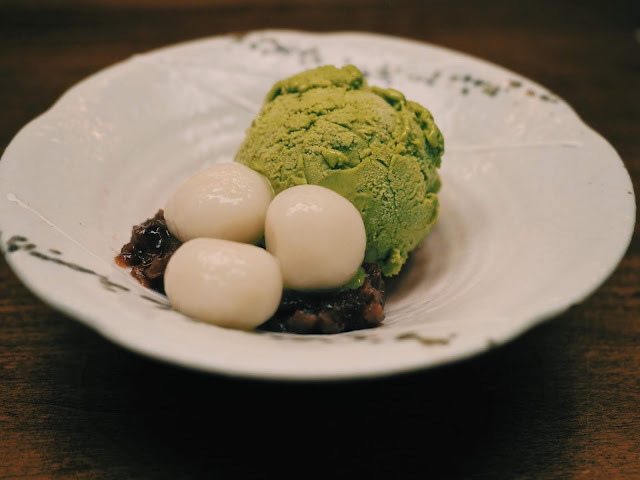 The combination of green tea ice cream with Japan imported red bean paste and glutinous rice balls is the perfect depiction of Japanese desserts, giving a refreshing taste after all the dishes we had earlier on. 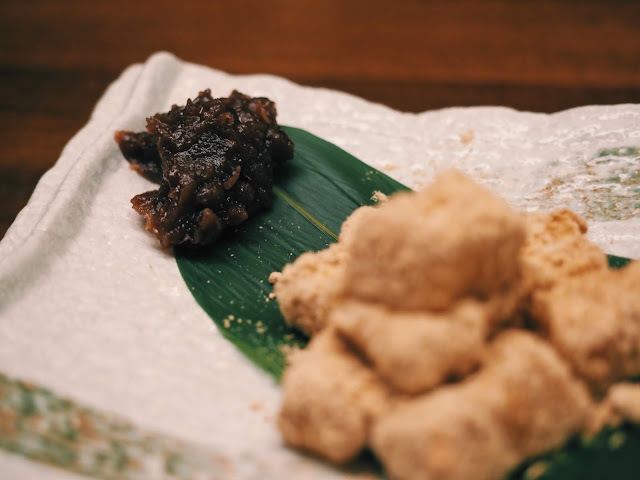 This homemade rice cake with Japan imported red bean paste is a must order as the rice cake is chewy and covered with subtle flavoured soy powder which balanced well when paired with red bean paste. 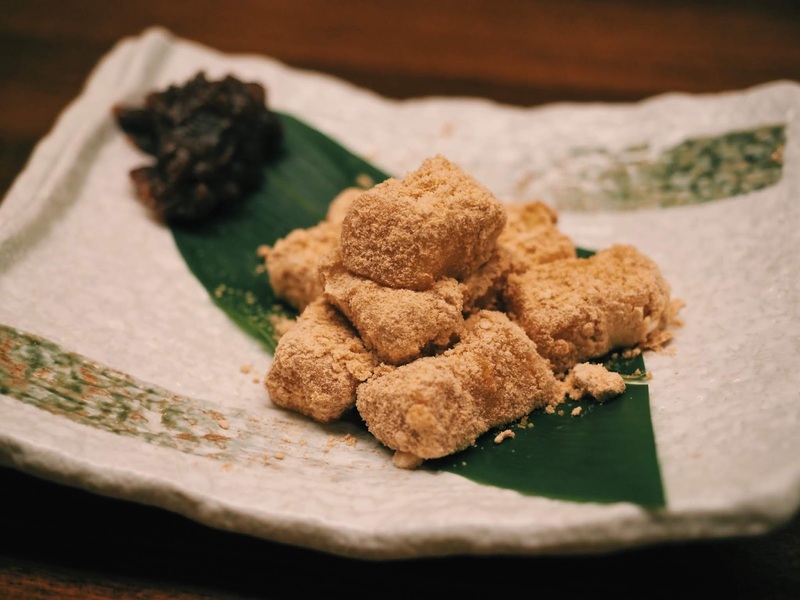 This rice cake is my favourite too as it is hard to find such chewy texture. Overall I enjoyed my dining experience at KIMI-YA because of the fresh ingredients they used to produce each and every dishes for diners, making sure our taste buds are well taken care of with various housemade recipes as well as offers a wide varieties of Japanese dishes, cater for each and every diner needs. 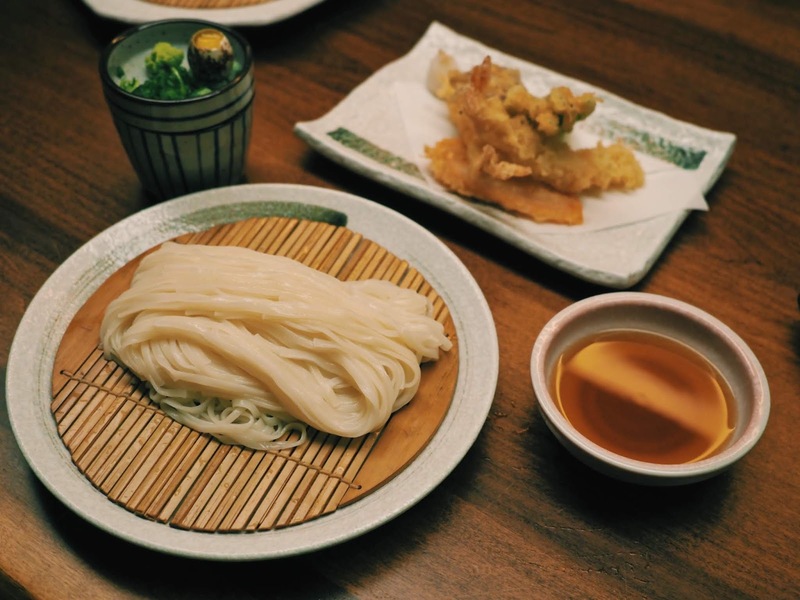 I'm definitely visiting KIMI-YA very soon because I'm craving for their Zaru Inaniwa Udon now! Address: G-2, Avantas Residences, 162, Jalan Klang Lama, Kuala Lumpur.